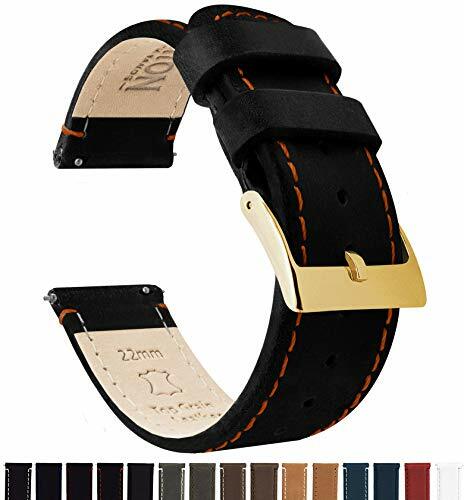 This 18mm quick release watch band is for Asus Zenwatch 2 1.45" band, Huawei Watch 1st band, LG Watch Style band, Withings Activité/Steel HR 36mm band,Fossil Q Tailor/Venture/Scarlette band, and others using 18mm spring bars. For more styles and colors, please search: B07CTFPMHX B07D32M8QJ B07F27H2KN. 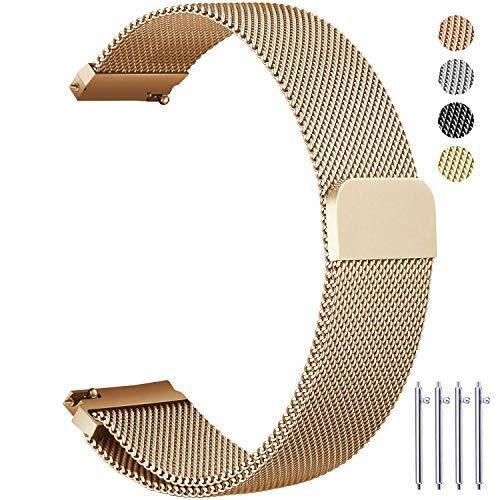 Replacement band size: The 18mm watch band is designed to fit almost any wrist, 5.2" - 8.7". Flexible stainless steel watch band with strong magnetic Milanese Loop allows for individualized adjustment to achieve the perfect fit. Easy Installation: Quick Release design allows changing your watch strap in seconds. Unique magnetic clasp can adjust and lock your watch band easily and securely and no buckle is needed. Three quick release pins are included in the package for replacement. 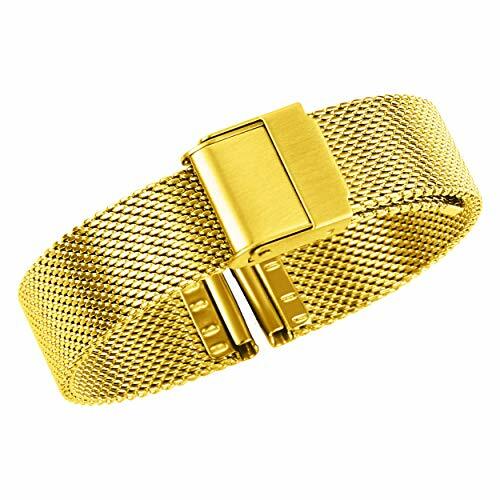 Superior Quality: This 18mm milanese band, fully magnetic and infinitely adjustable, is finely polished, anti-sweat and anti-erosion. RoHS certified to contain zero harmful or toxic substances. Warm Tips: Please ensure you choose "Sold by Fullmosa" for guaranteed quality. We are the ONLY authorized retailer of our brand. If you have any problems, please contact us for prompt and courteous service. Our contact information can be found on the every genuine Fullmosa box. 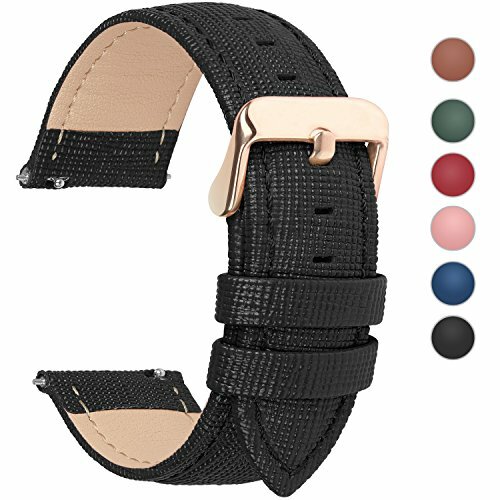 This 18mm quick release watch band is for Asus Zenwatch 2 1.45" bands, Huawei Watch 1st band, LG Watch Style band, Withings Activité/Steel HR 36mm band, and others using 18mm lug width. For more styles and colors, please search: B07CTFPMHX B07D32M8QJ B07F27H2KN. Superior Quality: The asus zenwatch 2 bands 18mm, fully magnetic and infinitely adjustable, is finely polished, anti-sweat and anti-erosion. RoHS certified to contain zero harmful or toxic substances. Rich Black color - 18mm wide at the lugs with a 16mm wide buckle - 3.5mm thick - 7.5" total length. 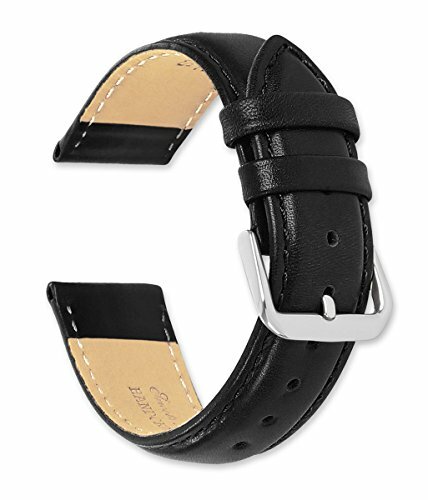 These deBeer Stage Coach leather watch bands come in three colors, including classic black, brown, or reddish-brown. With the variety available, there's sure to be something for everyone, and each color can be easily integrated into anyone's wardrobe for a subtle and timeless look. 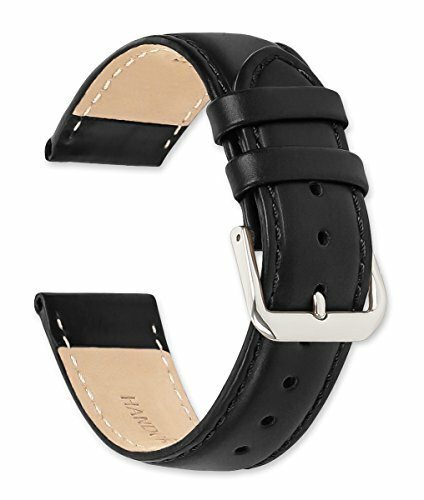 GENUINE LEATHER WATCH BAND - The deBeer Coach Leather Watch Strap is made with genuine Italian calfskin leather with a smooth finish. With its semi-matte finish and hand-stitched edges, these watch bands offer an aesthetically beautiful and high-quality addition to your watch, whether you wear the band everyday or only on occasion. 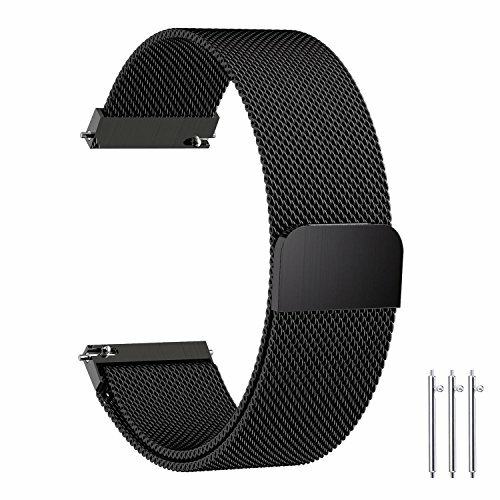 Compatible with any traditional watch or smart watch that uses 18mm spring bars. New spring bars are included. Measure width where band meets the watch casing as seen in the third image on the listing. You can also find the width specifications for most watches by searching online. FREE WATCH BAND SHIPPING - When you order your deBeer Coach Leather Watch Strap, you won't pay any additional fees in shipping or handling costs. At deBeer, we provide our customers with the highest quality watch gear for the lowest possible price, so we don't charge any shipping fees on top of the initial purchase price. 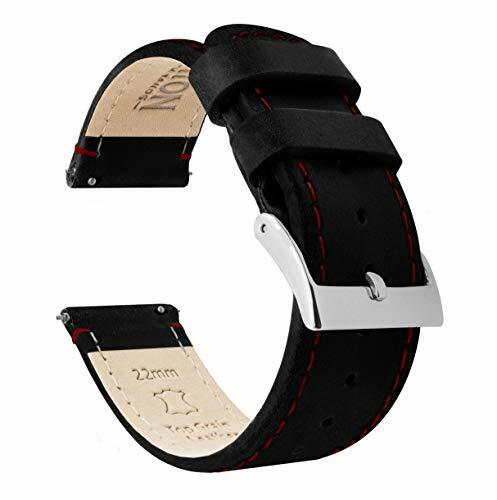 18mm Watch Band: Compatible with any traditional or smart watch with 18mm lug width. Quick release spring bars are included with and integrated into the band. So it is important that your watch's lug width matches the band width - 18mm. Otherwise, the 18mm band does not fit your watch properly. 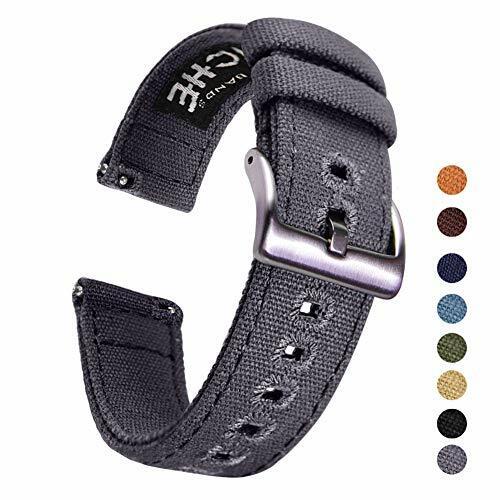 Measure the width where the band meets the watch casing before ordering.If you are looking for more styles and colors, please search: B07CTFPMHX B07D32M8QJ B07F27H2KN. SMART WATCH WIDTHS: The following picture part has listed the proper width for most popular smart watches use 18mm lug width - Asus Zenwatch 2 1.45"; Huawei Watch 1st; LG Watch Style; Withings Steel HR 36mm; Withings Activité. Sizing: Designed to fit almost any wrist. The 18mm bands are 2.95" x 4.53" (7.48" total length).10 (18mm) precision cut eyelets allow for individualized adjustment to achieve the perfect fit. Two cross-stitched collars allow the ban to be secured. Refined, Durable, and Comfortable all in one. 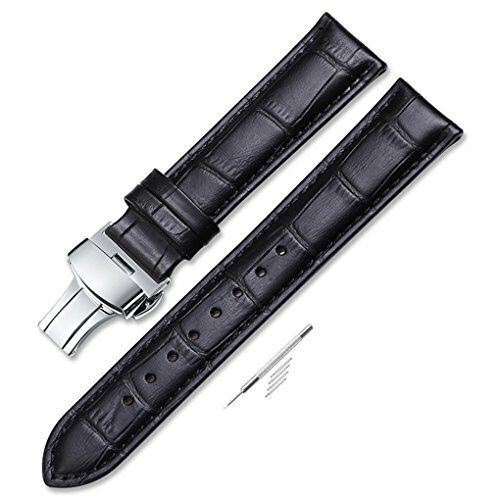 Men's Extra Long Length (9") Fine Italian Calfskin leather watch strap has a beautiful semi matte finish. 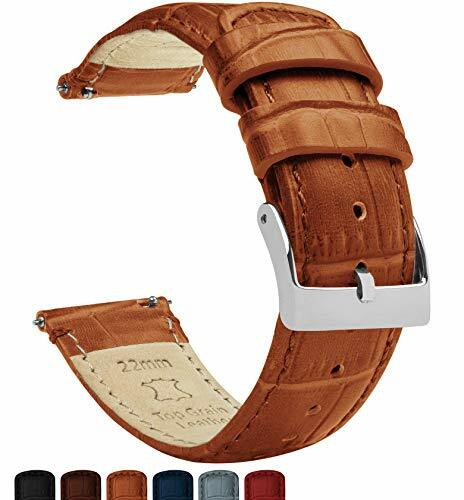 With its hand-stitched edges, these watch bands offer an aesthetically beautiful and high-quality addition to your watch, whether you wear the band everyday or only on occasion. 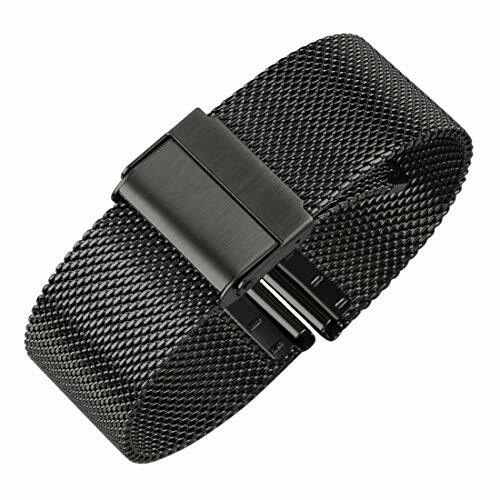 Compatible with any traditional watch or smart watch that uses a 18mm watch band. New spring bars are included. Measure the width of your watch where the band connects to the watch. You can also find the width specifications for most watches by searching online. Spring bars included. Nubuck leather lining. 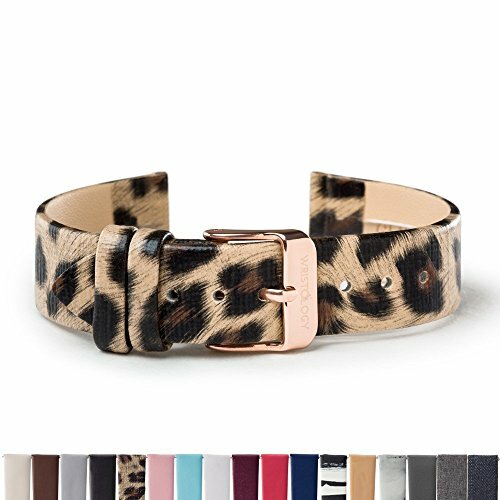 Hypo allergenic nickel free buckle in silver color is installed with an extra gold buckle included. 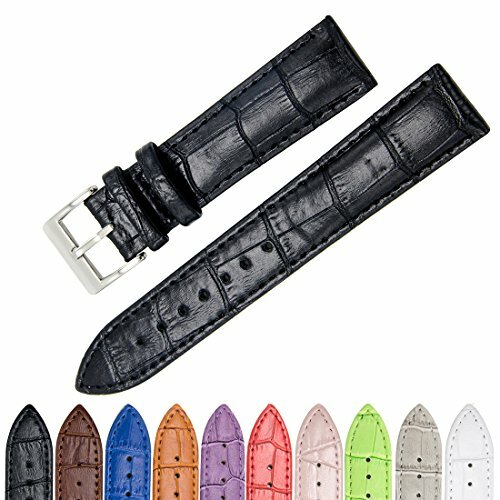 One of our finest leather and most popular watch bands. 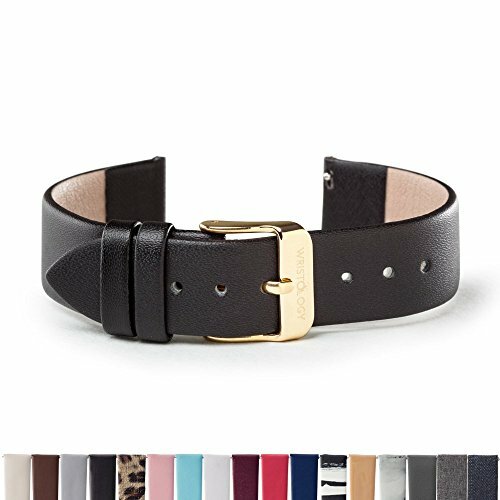 These deBeer top grain leather watch bands can be easily integrated into anyone's wardrobe for a subtle and timeless look. EASY CHANGE - no tools required, just depess the pin on back of the strap. 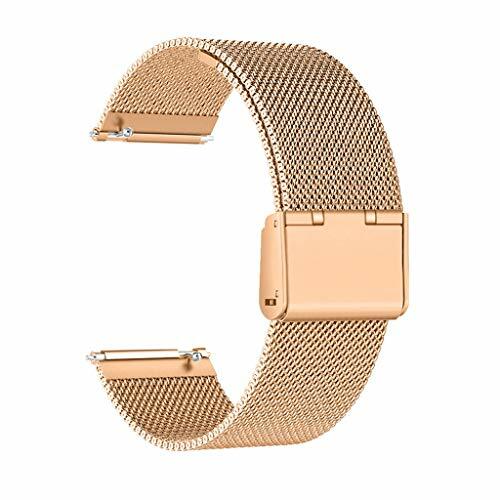 Top Quality Stainless steel Material: Fullmosa smart watch band is cut and crafted from premium 304 stainless steel, high-tech surface, luxury, nobility and durability, as every detail has been taken into account in the manufacturing process in terms of workmanship, design and aesthetics. 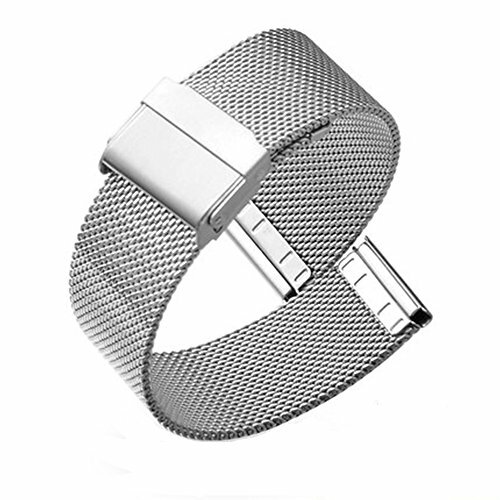 Watch Band Width: Compatible with most smart and traditional watch that uses 20mm lug width. 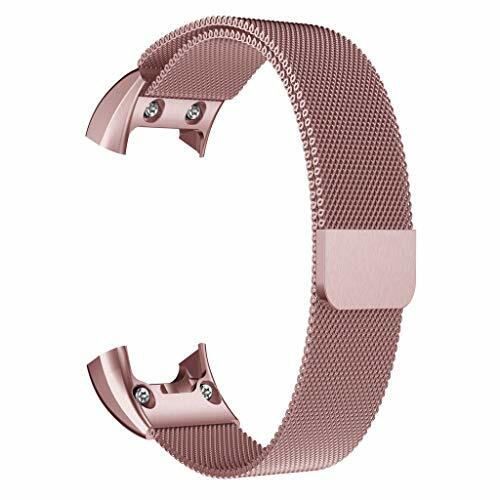 The size can be adjusted according to the circumstance of individual wrist, watch band can be shortened or extended with the attached link-remove tool to fit your wrist perfectly. Unique Design: The double push button design makes additional protection for your watch, safer than many other clasps. Unique Fold-over clasp and two double push buttons lock your watch band easily and securely, and the clasp gives you both fashion and convenience. 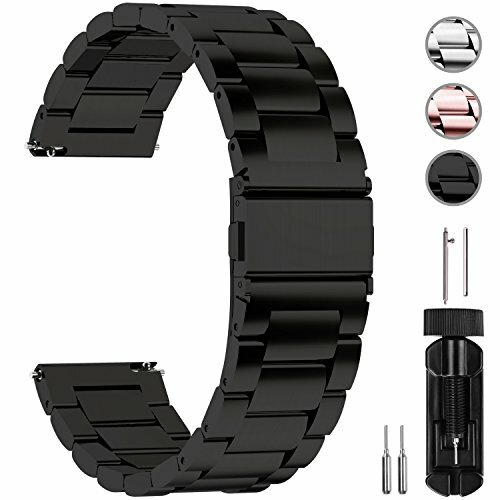 Compatibility: 20mm watch band - Huawei Watch 2; Moto 360 2nd Gen Men's 42mm; Pebble Time Round Large; Rolex Datejust Ref. 1601; Samsung Gear S2 Classic(not fit Samsung Gear S2),Samsung Galaxy 42mm; TICWATCH 2; Withings Steel HR 40mm. 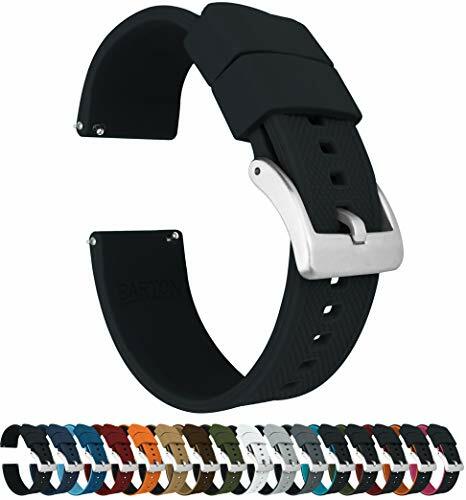 Quick Release Watch Band: Compatible with most traditional or smart watches that use 18mm, 20mm, 22mm spring bars. Quick release spring bars are included with and integrated into the band. No tools or engineering degrees required. 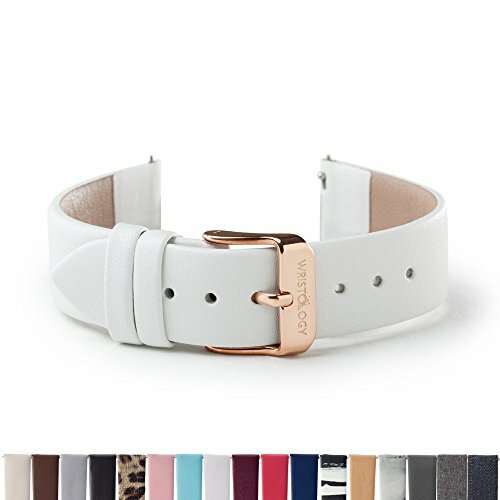 Our stylish watch straps come in multiple colors, so you can switch it up in seconds. Color coordination was never so timely. Premium Materials: Cotton canvas is durable, soft, breathable with embroidery added for strength & style. brushed 316L stainless steel buckle with solid tongue. In order to maintain a good look of the strap, I suggest that you do not use it in the water for a long time. 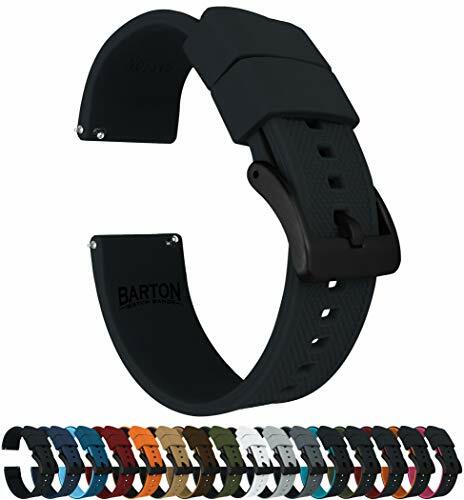 Flexible Fit: Ritche quick release straps will fit wrists from about 5.5" to about 8" around, depending on strap width and watch size, which will comfortably fit most men and women. Measure exactly the width of the Lug when it is installed on the watch. Measure exactly the width of the place where the watch band attaches the watch.Note:The error of 1mm can lead to inappropriate,it should be keep the 100% exact size measuring. Simple but classic design.Trendy fsahion Now. Perfect match for your other watch and daily wearing. 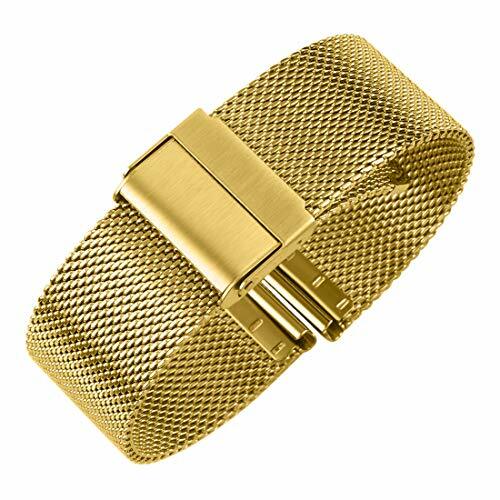 Suitable For Watches,such as Tissot, Armani, Seiko, Daniel Wellington etc. But must make sure watch band width,Not Length. This band just for watches strap replacement. Top Quality Material-Made of 316L stainless steel, waterproof and sweat stink free and tasteless, washable. Smooth and flexible, and feels great on your wrist. Stainless steel, finely polished and anti-sweat erosion, fully magnetic and infinitely adjustable watch strap. Compatibility: 20mm watch band - Fossil Q Gazer,Huawei Watch 2; Moto 360 2nd Gen Men's 42mm; Pebble Time Round Large; Rolex Datejust Ref. 1601; Samsung Gear S2 Classic（not fit Samsung Gear S2）; TICWATCH 2; Withings Steel HR 40mm. Unique Design-Features with two Quick Release pins which allow you to change your strap with your fingers in seconds. 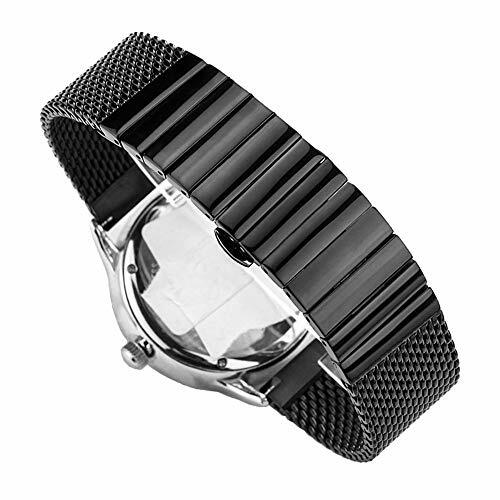 Easy to assemble and remove without extra tools.Strong magnetic clasp,no buckle need, secure to hold your watch. 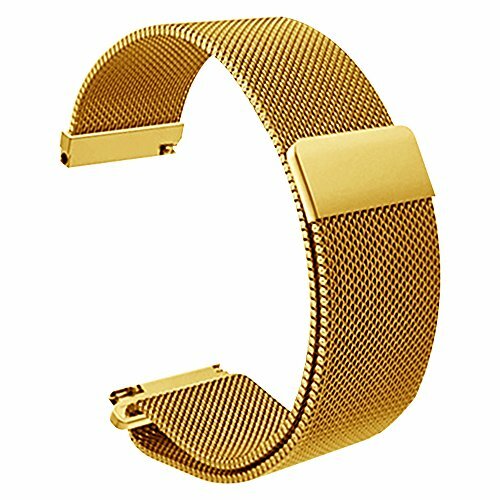 Size: Designed to fit almost any wrist, 6.2" - 8.7", allows for individualized adjustment to achieve the perfect fit.Compatible with any traditional or smart watch that uses 18mm 20mm or 22mm band. 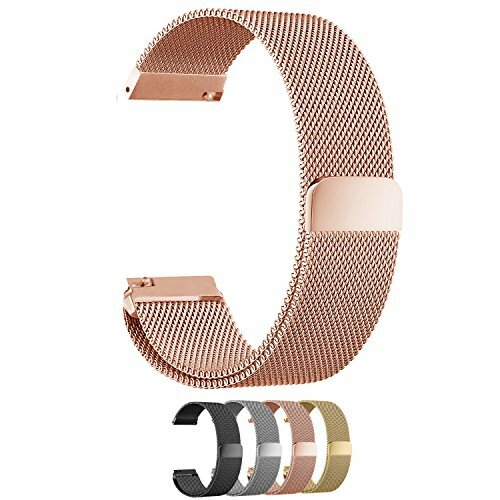 Package & Service:1 x Milanese Loop Replacement Band,4 x Spring Bars. One year warranty, Order With Confidence. If you have any problems with your purchase, simply contact us and we will take care of it. 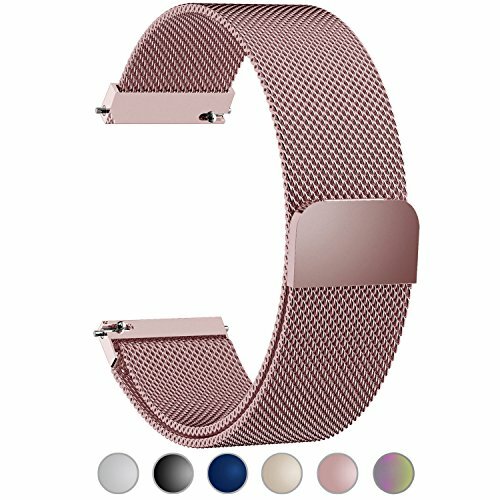 The watch band is for Huawei Watch 2 band, Samsung Gear S2 Classic band (not fit Samsung Gear S2), Moto 360 2nd Gen Men's 42mm watch band(not fit Moto 360 2nd Gen Men's 46mm and Moto 360 2nd Gen Women's 42mm), Pebble Time Round Large watch band, Ticwatch 2 bands, Withings Steel HR 40mm band, Amazfit Bip band, and others using 20mm lug width. 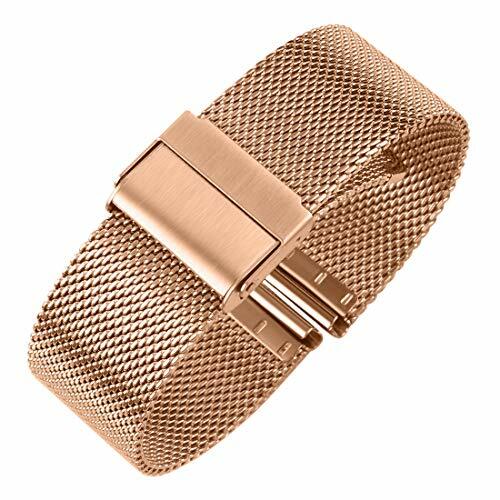 Milanese band size: The 20mm watch band is designed to fit almost any wrist, 5.2" - 8.7". 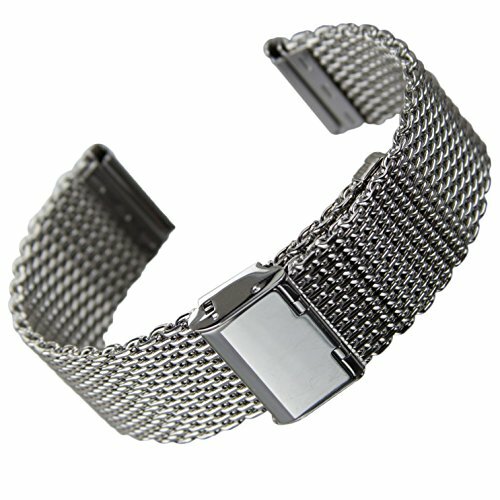 Flexible stainless steel mesh with adjustable and strong magnetic Milanese Loop allows for individualized adjustment to achieve the perfect fit. Easy Installation: This quick release watch band allows changing your samsung gear s2 classic band in seconds. Three quick release pins are included in the package for replacement. For more styles and colors, please search: B07F3LYMCN B07D32M8QJ B07F27H2KN. Superior Quality: The S2 classic gear bands, fully magnetic and infinitely adjustable, is finely polished, anti-sweat and anti-erosion. RoHS certified to contain zero harmful or toxic substances. Warm Tips: Please ensure you choose "Sold by Fullmosa" for guaranteed quality. We are the ONLY authorized retailer of our brand. If you have any problems, please feel free to contact us. Our contact information can be found on the every genuine Fullmosa box. 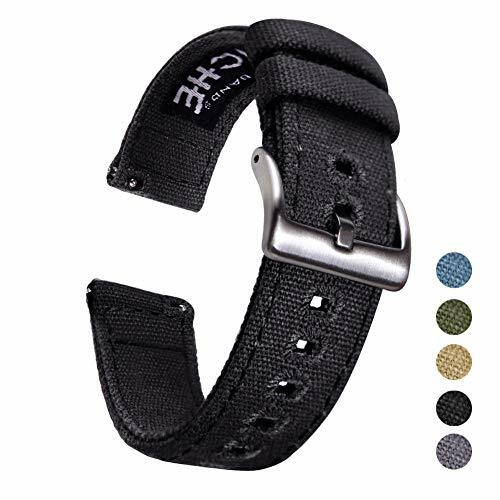 Watch Band Width: Compatible with most smart and traditional watch that uses 22mm lug width. 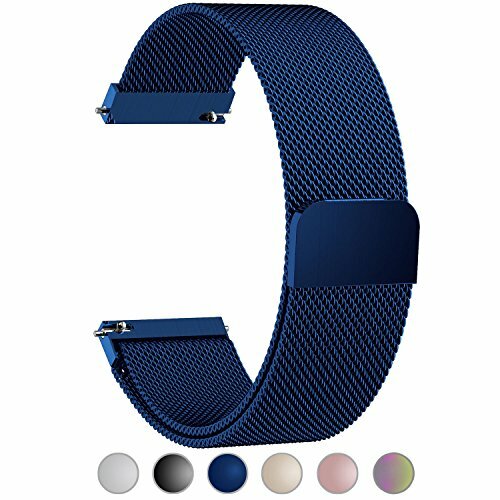 The size can be adjusted according to the circumstance of individual wrist, watch band can be shortened or extended with the attached link-remove tool to fit your wrist perfectly. 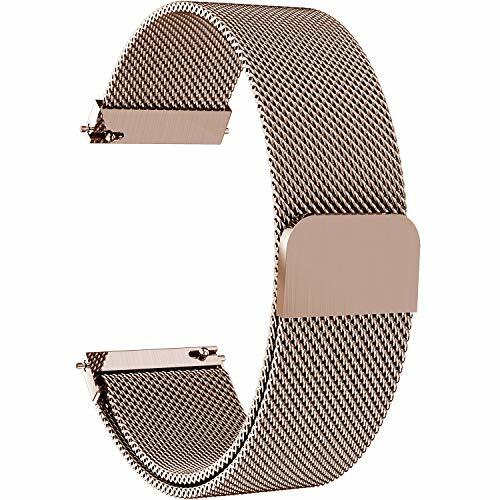 Compatibility: 22mm watch band - Asus ZenWatch 2 1.63" WI501Q; Basis Peak Fitness Tracker Watch; Cookoo Smart Watch; Casio MDV106;Huawei Watch 2 Classic,Huawei GT Watch; LG G Watch W100, Moto 360 2 (2nd Gen, 46mm 2015); Martian Notifier Smart Watch; Pebble Time/Pebble Time Steel/Pebble Classic; Samsung Gear 2 R380, Neo R381, Live R382; Samsung Gear S3 Classic and Frontier,Samsung Galaxy 46mm.